Description: Gold Purple and Lilac Triple Graduation Honor Cords Three, solid color Single Honor Cords tied together. Tassels are the same color as the cord they are on. Length: Standard length of approximately 5 feet long with 4 inch tassels on each end. Thickness: Approximately 3/8 inch. These are not the thin and cheap 1/4 inch diameter cords other companies are selling. Color: Click on drop-down list select color combinations. Three, solid color Single Honor Cords tied together. Tassels are the same color as the cord they are on. Length: Standard length of approximately 5 feet long with 4 inch tassels on each end. Thickness: Approximately 3/8 inch. These are not the thin and cheap 1/4 inch diameter cords other companies are selling. Color: Click on drop-down list select color combinations. 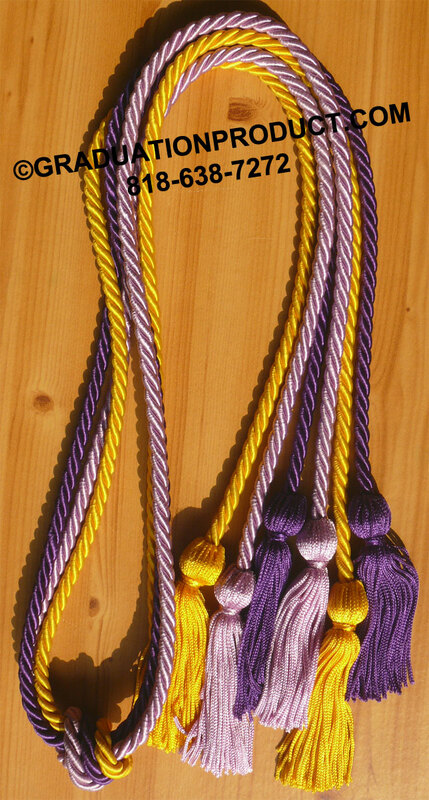 Customer Reviews on "Gold Purple and Lilac Triple Graduation Honor Cords"
Write you own review on "Gold Purple and Lilac Triple Graduation Honor Cords"